The 2017 Stanley Cup has been decided as the Pittsburgh Penguins skated away with hockey’s ultimate team trophy for the second straight season and fifth time overall. There were plenty of prime time performances throughout the Playoffs, including these five players who topped the charts in points. And there’s certainly a bird theme: four Penguins and one Duck. In 25 games, Geno netted 10 goals to go along with 18 assists. The 30-year-old will have to find trophy space for his now third Stanley Cup win. The centre’s impressive hardware haul also includes the 2012 Ted Lindsay Award, the 2009 Conn Smythe Memorial Award and the 2007 Calder Memorial Award. Crosby’s Playoff effort yielded a league-leading 19 post-season assists, eight goals and a second consecutive Conn Smythe as Playoff MVP. The Pittsburgh captain’s winning ways might not be over yet: he’s one of three players (Connor McDavid and Brent Burns are the others) up for the coveted NHLPA’s Ted Lindsay Award. 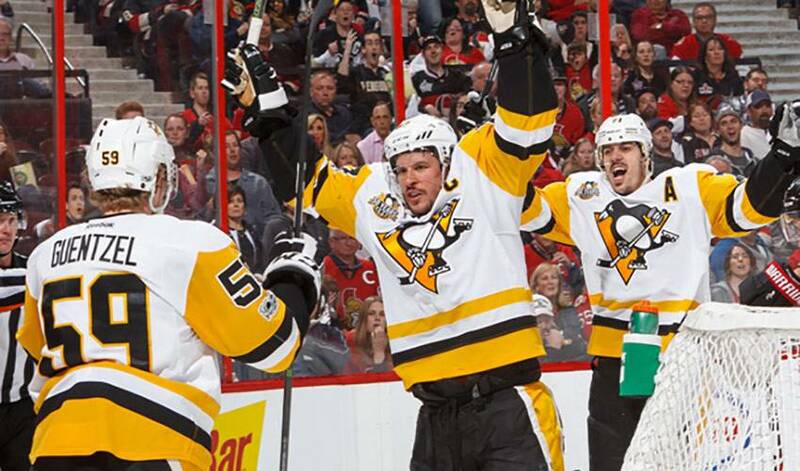 Should Crosby win, it would be his fourth such honour. Kessel led the pack with five power-play goals (eight overall) and chipped in with 15 helpers. The Wisconsin native now has 66 points in 71 career playoff contests, along with two Stanley Cup triumphs. How do you turn heads in your first NHL playoff action? For the 22-year-old Guentzel, it came in the form of a league-leading 13 goals, 11 even-strength tallies and five game-winning markers. In his 2016-17 rookie regular season, the Nebraska native netted 33 points in 40 games. The Anaheim captain averaged slightly over a point-per-game in the 2017 Playoffs. Getzlaf scored eight goals and recorded 11 assists for 19 points in 17 games. In 121 post-season contests, the 32-year-old, who won the Cup in 2007, has 118 points, including 37 goals. Kirk Thompson still remembers the first time he met the “scrawny kid with the blonde, curly hair and the big smile.” And he certainly hasn’t forgotten the first time he faced Jake Guentzel on the ice. Derick Brassard didn’t need six weeks to become comfortable in his new surroundings with the Pittsburgh Penguins.